Scrivener is my favorite (script) text writing tool. Scrivener 2 has added so many features that, back when it was still in beta, I literally sat, my chin dropped, in front of my computer. 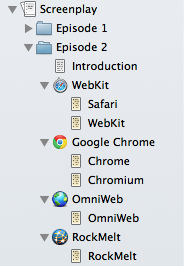 One day Keith wrote a mail asking whether we’re happy with all icons that are added in Scrivener 2. Icons? What? When we, The Woman™ and I, investigated she said “I wish there was a test tube icon for scientific writers”. One week later Scrivener had a test tube icon. To add an icon to a document right click a document in the Binder and choose one from the predefined ones. But that’s actually just the beginning. You can also add your own custom icons on a project and global basis. Just click on Documents → Icons → Manage Icons… (or right click a document). 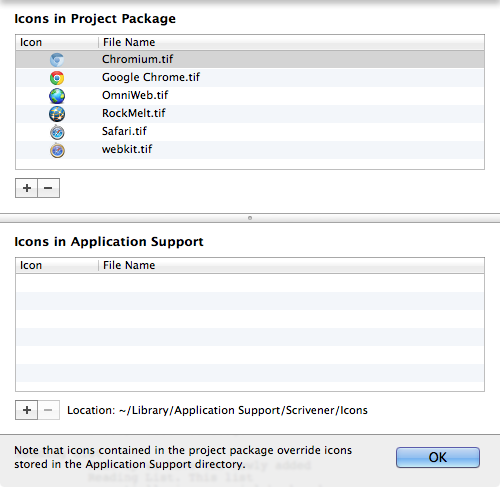 A new dialog appears where you can drag in custom icons that are then shown in the Icons submenu.